Mother Nature’s most precious gifts, natural fancy coloured diamonds are extremely rare and valuable. 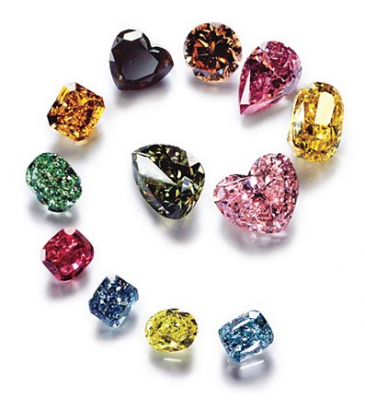 Varying in colours from red (the most rare) to pink, blue, green, orange, green, yellow and even brown, fancy coloured diamonds do not fall into the white diamond colour range and are extremely uncommon and valuable, with only one fancy coloured diamond discovered for every 10 thousand colourless diamonds mined. The more rare a diamond, the more valuable it is, so the odds of one fancy diamond per 10000 colourless diamonds, it is easy to imagine just how valuable fancy diamonds are in the jewellery industry. Natural fancy colour diamonds that are mined are generally small in size, usually weighing less than a carat. In contrast to colourless and near-colourless diamonds whose value is dependent on their lack of colour, natural fancy colour diamonds are valued especially for the intensity and distribution of their hues. Natural fancy coloured diamonds are formed in the presence of additional trace elements and distortions of the diamond crystal. If an element interacts with carbon atoms during the creation of a diamond, the diamond’s colour can change. There are three different ways in which natural fancy coloured diamonds are formed and categorised as Type l, Type lll and Type lll diamonds. These diamonds are formed when a foreign element such as Nitrogen is introduced to the carbon material that a diamond is made from. Nitrogen can result in a diamond to having yellow or orange hues, or even pink, green while Boron can make it blue. Diamonds with nitrogen atoms in their atomic structure comprise the most abundant group of diamonds. The nitrogen in fancy coloured diamonds absorbs colour, and this difference makes them yellow and orange. Nitrogen also is linked to colour in brown diamonds, in some blue and green diamonds, as well as in pink diamonds. Diamonds in the nitrogen group comprise 98% of all natural fancy colour diamond and are divided into different types depending on the way nitrogen bonds with carbon in the diamond’s internal structure. Type lla diamonds are the purest diamonds found in nature, and consist almost completely of carbon. They can vary from colourless to brown or pink. Type IIb diamonds are ultra-rare and free from nitrogen, instead containing boron (B) atoms in their nearly-pure carbon structure which result in a natural blue fancy diamond. The third group refers to those diamonds that receive their colours by other means that are known, but not understood very well. A great example is green coloured diamonds, who derive their colour from exposure to radiation. Until the 16th century, the most celebrated diamonds- colourless and fancy coloured diamonds -all came from India. The most well-known historical and current sources of natural fancy colour diamonds are from India, South Africa and Australia, as well as Brazil, Venezuela, South America, Russia, and Indonesia. In South Africa we are known particularly for our red, pink, blue, orange and yellow natural fancy diamonds. Discover the world’s most famous and valuable natural fancy diamonds and colourless diamonds here.